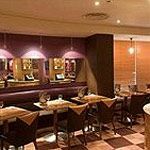 Located in the Holiday Inn Regent's Park, The Junction restaurant serves a variety of modern British dishes. Do you work at The Junction? What did you think of The Junction? The Junction do a good mixed platter that's great to share with friends. There's a really cool atmosphere in there too. Recommend The Junction for a fun group meal.